How do I create the ideal acoustic environment? What is the difference between a traditional and a Cambridge Sound Managment sound masking system? How effective is sound masking? Before we dig too deep into the benefits, we will cover the ABC’s of an acoustic environment. ABC stands for Absorb, Block, Cover. Absorb would entail some type of acoustic ceiling tile. Block would be a partition or cubicle wall. Cover is where the sound masking emitters come into play. The emitters will cover any noise that is not absorbed or blocked. 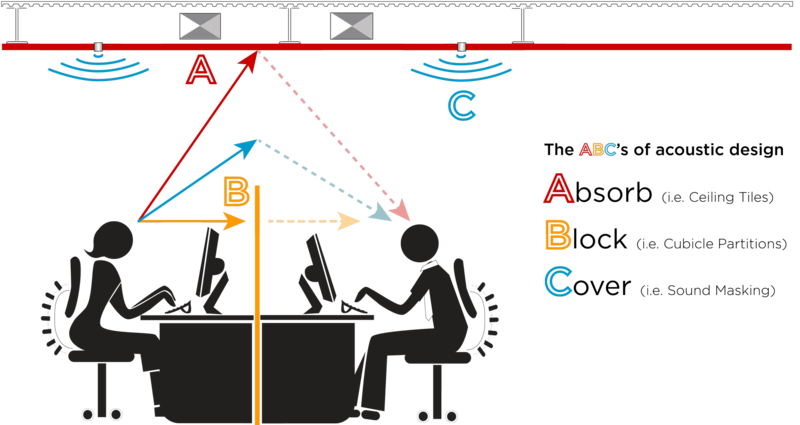 Here is a diagram depicting the ABC’s of sound masking. You may still be wondering what sound masking actually does. Sound masking is the “cover” portion of the equation. Sound masking is the addition of an unobtrusive background sound, similar to airflow, to reduce the intelligibility of human speech and reduce distractions. The resulting environment leads to greater productivity and increased privacy and comfort. These systems are meant to successfully muffle the human voice, leading to a more productive work environment. We specifically offer the Cambridge Sound Management product line through our site. The Cambridge products differ from traditional sound masking in a couple ways. Traditional sound masking systems, known as “in-plenum,” use large paint can-like loudspeakers installed above the ceiling tiles. Sound is bounced off the ceiling deck, through the ceiling material into the work space below. The sound from these systems can be unpredictable and create “hot” and “cold” spots. Masking sound can easily overflow into undesired spaces. In-plenum systems require significant design, installation and tuning time because there are many unknowns above the ceiling. If no ceiling exists, there is no plenum for traditional systems to operate within, significantly impacting performance. Also, in-plenum systems often require much more power than the Cambridge solutions. Below you can find a diagram showing a traditional sound masking setup. The Qt Quiet Technology systems from Cambridge Sound offer several benefits. With the direct field approach to sound masking, the Qt system uniformly disperses the masking sound into the space and eliminates masking sound overflow into undesired areas. The pre-tuned masking sound is emitted through four sequenced channels that eliminate acoustic interference. Additionally, our Qt systems deliver more energy in the octave bands that are related to speech, resulting in a more energy efficient system that successfully masks speech at lower volume levels. Below you can find another diagram depicting a Cambridge system. Many studies have been done that detail the positive effects of having sound masking installed in your office. In a study done from 2006 to 2008, researchers found that the addition of sound masking increased speech privacy from 35% to 90%. Study participants also had a nearly 10% improvement in their ability to recollect a series of numbers and words after the addition of sound masking. In a 2008 survey, researchers found that workers lost an average of 21.5 minutes each day to conversational distractions and 48% of survey respondents reported that conversational distractions were the leading cause of workplace discomfort. In summation, sound masking provides an increase in privacy, which allows for less distraction, less stress, and an overall more productive work environment. Thank you for taking the time to read this article. Please feel free to reach out to us for assistance with your sound masking needs. You can reach us at 610-518-2200 or sales@conferenceroomsystems.com.